The bee is one of the oldest and perhaps the most important insect in the animal kingdom, as they pollinate plants that bear the fruits and vegetables we eat. While some bees are solitary, species such as honey bees and bumble bees are tremendously social. Bee colonies consist of the queen bee, infertile female worker bees, and male drones. Bee swarming typically occurs in colonies that are thriving and with robust populations. Scouts are typically sent to find a new location to relocate. 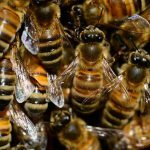 Typically, honey bee swarms are not a major threat, unless we’re dealing with Africanized honey bees. Honey bees will sting if provoked. People can have severe allergic reactions to bee stings. When a bee colony matures and relocates they may choose your property to relocate. Typically they will “swarm” the area and form a cluster at the location of a new hive. This can be in several outdoor fixtures, buildings, trees, etc. If you notice the cluster is located on your home, try to determine if the cluster size is shrinking. This usually indicates the bees have found an opening and may be creating the hive inside your home. Can you correctly identify the stinging insect? Is there a cluster of bees on a building or outdoor area? Do you have a hive in your yard? Do you have a hive in your walls or your roof? Do you have a hive inside a tree? Do you have a hive in your chimney?